I've made this recipe a few times now and loved it each time. Aside from apples, I've made one using fresh peaches, pears and even blueberries. It's super easy and the neat trick that I learned was topping the bottom pie crust with panko breadcrumbs before filling. The panko absorbs any juices from the fruit filling, resulting in a crisp bottom - no more soggy pies! I loved this trick and will be applying it many more times with the pies I make in the future. Divide pie crust dough into 2 pieces on a ratio of 6 to 4. Roll out the larger of the two pieces into a rectangle about 11" x 15". Place in a 9" x 13" cake pan. Push the pastry up the sides of the pan a bit to make a shallow container for the apples. Spread the bread crumbs over the pastry. Spread the apples over the bread crumbs and sprinkle the cinnamon sugar and the nutmeg over the top. Cut the butter into small pieces and dot over the top. Roll the remaining piece of pie dough into a 9" x 13" rectangle and cover the apples. Brush with egg wash. Slash the crust 6 or 8 times to allow steam to escape. Bake for 60 to 65 minutes until crust is golden brown. Remove from oven and allow to cool completely while you prepare the glaze. Combine the glaze ingredients and stir until smooth. It should be thick but pourable. Adjust the ingredients to achieve the consistency you need. Pour over pastry. Never would've imagined panko in a dessert, I like it! These bars look amazing! I'll have to try them in a few weeks at the peak of apple season :) I was wondering though, because it doesn't say in the ingredients, how much puff pastry is needed? Hi Sarah - the recipe calls for 2 pie crusts, either homemade or store bought. Thanks for asking! oh boy a recipe without home made pie crusts tossed in my face! These look simply delicious and easy to make. I like that they are made with the pre-made crusts as I'm not much of a baker and my crust never comes out right. 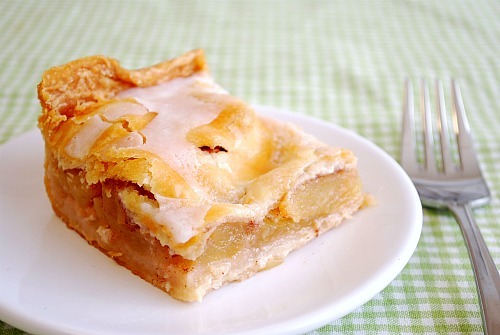 Apple pies are on my list of things to make in the Fall, too! These bars will have to be sooner rather than later though. Thanks for the recipe! When I saw panko in this dessert I was a little concerned, but looking at the final product I'm digging this dish! It looks like a pie, a bar, or a cookie. I like anything apple so I want to try this! Thank you so much for sharing this recipe. It looks easy to make. I can't wait to give it a try. I like everything about this recipe! All of the ingredients are easy to get, most I already have on hand. I used to buy apple slices, from the supermarket. Did not know they were so easy to make! Aside from slicing the apples,this couldn't be easier and I know its delicious! I have made very similar for 35 years no fail. However, I find when making an apple pie or apple bars, putting 2 caps full of almond extract on filling makes it an award winning apple pie or bar. I bake bottom crust a few minutes with fork holes in it and instead of panko, ( not good for soy alergies ), I use small tapioca pearls. How is this if made the day before? I've been making these apple slices my whole life! We obtained the recipe a German recipe from my mother's friend at church, probably around 1974. They possess such a subtle nuance of flavor all their own as an apple pastry, and are easy to serve. Absolutely lip-smackingly, finger-lickingly delicious! I've been making these very apple slices my whole life! Almost exactly the same recipe as the one my mother obtained from her German friend at church. These have a subtle nuance of floral flavor all their own as an apple pastry, and they're easier to successfully serve than apple pie. As a food stylist, I love the look of the translucent glaze against the flaky pastry. Absolutely lip-smackingly, finger-lickingly delicious! My grandma gave me her recipe for these... A great memory after reading this pin! Thanks. Congratulations! We wanted to inform you that this post has been selected as a featured Archive Posts during the month of September. Can't wait to try this! I posted it to Stuffdot so I don't forget. We have family visiting this weekend so this will be perfect for dessert. I used to bake my pies at 350°F. and I always had a problem with a soggy, slimy bottom crust. I looked into it and found some professional bakers who boosted the oven temp to 400°F. all through the pie baking. I found that 400°F all the way through made for too crunchy a crust. So, after much trial and error, for all fruit pies, I now preheat the oven to 450°F. I set up a system so the filling doesn't stay in the bottom crust long at all. 1) Roll out the top crust and set it in the fridge. 2) Get the egg wash made and sanding sugar ready; set it aside - soften 1 - 2 Tbspns butter. 3) Roll out the bottom crust, prick it well and set it in the pie plate. Set aside. Make the filling, place it in the pie crust, dot with butter, put on the top crust, crimp, brush with egg wash and sprinkle with sugar, cut the slits in the top and get it right in the oven. Bake at 450°F for 15 minutes, reduce the oven temp to 350°F. , cover the edges of the crust and bake for another hour, or until the filling bubbles up through the slits in the crust. I always had to tell our children that even if the pie smells done and even if it looks done (tent with foil if it's getting too brown) - but a fruit pie is not done until the filling bubbles up. My German-Dutch grandmother made these. Her recipe called for covering the bottom crust with corn flakes to prevent it from getting soggy. She also baked them on a 15 x 10 cookie sheet. Bottom crust, corn flakes, apple filling and top crust...edges sealed to bottom crust that was extended up sides of cookie sheet. Glazed with powder sugar mixture when taken out of oven. Soooo good.